Back at the beginning of the summer a friend of mine brought these two gorgeous flannel charm packs back from America for me. 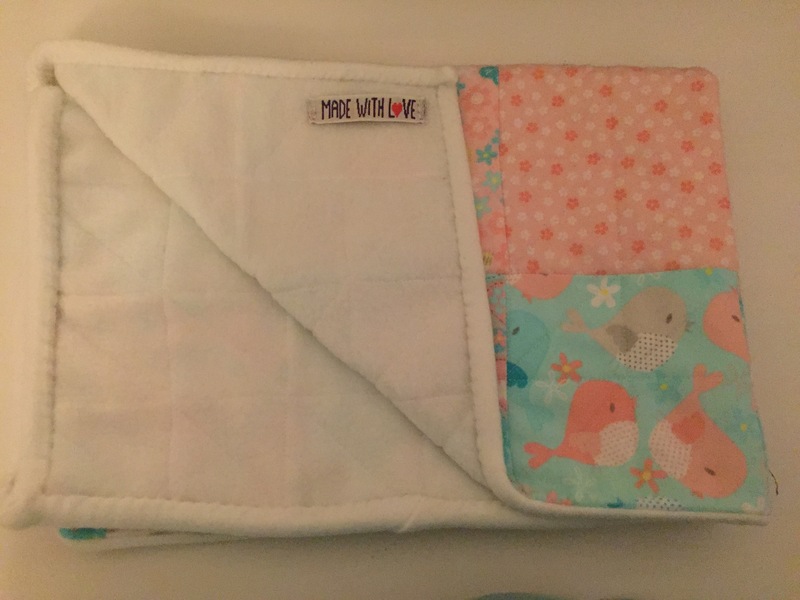 The blue and yellow pack became a comfy padded baby quilt for my brother and sister-in-law. When I later found out that their baby was going to be a girl, I couldn’t help but decide I had to make something with the pink one for them too! 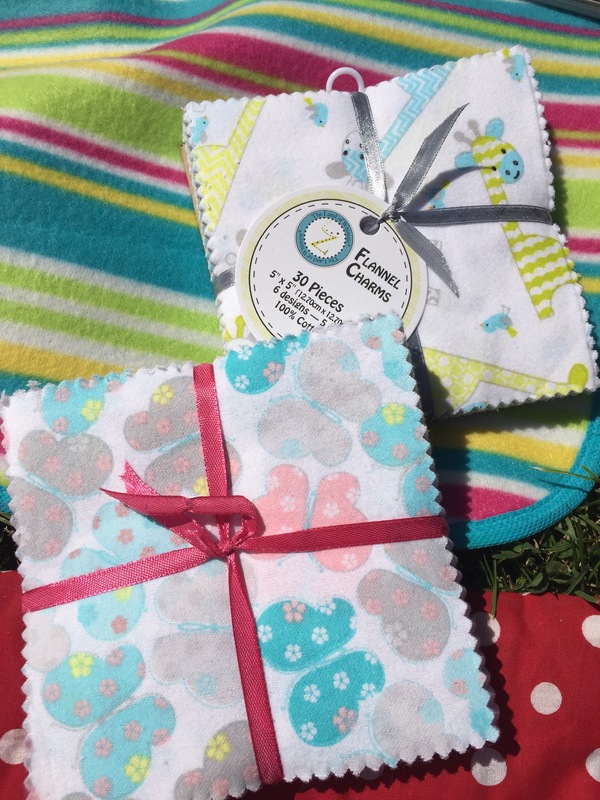 As the flannel charm packs are super soft, I thought I’d make a patchwork cosy comforter for the baby. The front is a normal square patchwork and the back is some lovely white fleece. Due to the pre-cut charms, the top came together really quickly and easily. I then basted it together with the fleece and “quilted” diagonal half square triangles through both layers to give a nice pattern on the back of the white fleece. I then bound the blanket with some “bias binding strips” of fleece. On reflection, this was a really bad idea, as the fleece did not make nice mitred corners at all due to being much too thick, but hey, you live and learn! I hand sewed the binding down to the back of the quilt and I was so pleased, my hand sewing is coming on a treat! Here’s the finished blanket! Apologies about the photos – it’s so tough to get good photos with less and less daylight every day! 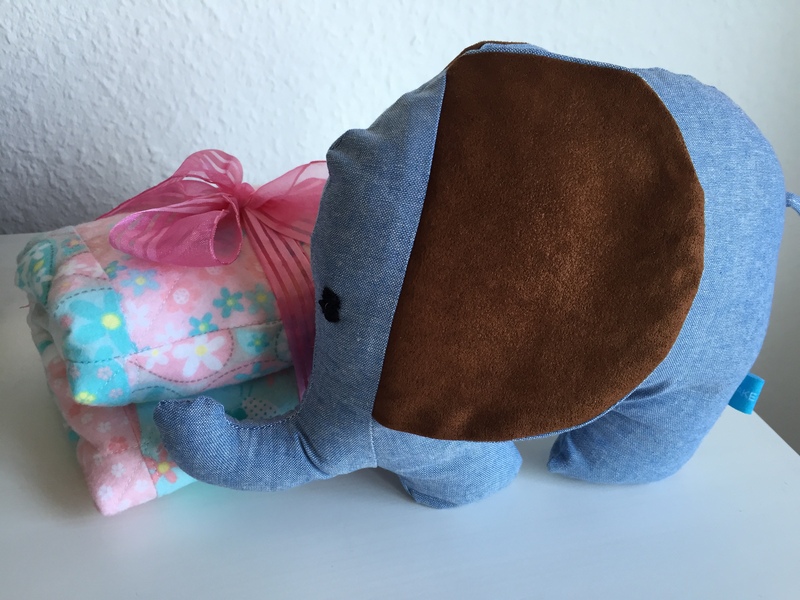 I also decided that it wouldn’t be fair if all of my friends’ babies received an Ernest the Elephant and my own niece didn’t, so I set about making one of those too. I used some chambray scraps from my Bettine Dress for the body of the elephant. I can’t believe that the 2m of chambray I bought have now made a dress, espadrilles and an elephant and I still have some left! I love making things with scraps as I really hate waste! I also had a fat quarter of faux-suede in brown in my stash that I got free with a sewing magazine, and thought that a couple of pieces of that would make lovely snuggle soft ears. I love the Birch Fabrics free template for this pattern – it’s such a nice shape and the little knotted tail is such a cute detail! 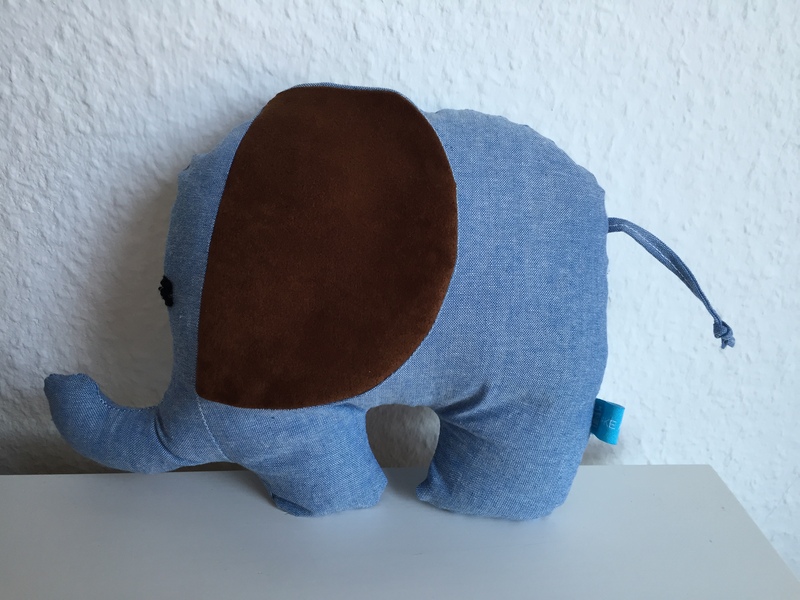 So here he is – my finished elephant! The jury is out as to whether he should be known as Edna or Egbert – I guess in the end we will let our niece decide when she’s here! Edna-Egbert was the first project where I got to use one of my new Make Amy Make labels! I loved being able to add a little label – it makes it feel more finished somehow! Both gifts went off in the post to England and are now in the nursery waiting for our arrival. Not long to go! How about you – do you like making gifts for friends and relatives? Have you made anything out of scraps recently that you’re proud of? Danke dir 🙂 ich könnte eine Armee von diesen elephanten machen – finde den Schnittmuster einfach toll!!! Such a lovely elephant. I really like making presents – I have a plan to make lots of things for the fast approaching festive season but I do need to make a start sooner rather than later! Hehe I was just thinking that today – must start making more things for others! I have a double quilt top to piece together and a sweater for my dad eeeek!